Both Kurt Weill – Maxwell Anderson musicals are being presented back-to-back this winter in New York City with star-studded casts. 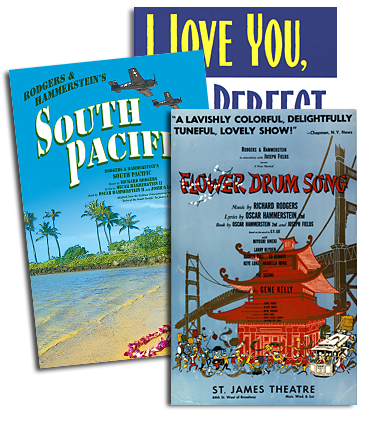 R&H Theatricals discussed these shows with KNICKERBOCKER HOLIDAY director Ted Sperling, LOST IN THE STARS music director Rob Berman, and Kurt Weill Foundation Associate Director for Publications and Research, Elmar Juchem. Kurt Weill teamed up with Maxwell Anderson to complete two Broadway musicals—Knickerbocker Holiday, a romantic comedy/political satire about the arrival of the last Dutch governor of New York, and Lost in the Stars, an earnest musical tragedy about the blight of apartheid in South Africa. Knickerbocker Holiday performed at Lincoln Center’s Alice Tully Hall January 25-26, presented by the Collegiate Chorale, directed by Ted Sperling, conducted by James Bagwell, and featuring Broadway luminaries Victor Garber, Ben Davis, Kelli O’Hara, Bryce Pinkham, David Garrison, and Christopher Fitzgerald. Lost in the Stars appears at New York City Center Encores! February 3-6, directed by Gary Griffin, music directed by Rob Berman, and featuring Chuck Cooper, Daniel Breaker, Patina Miller, Sharon Washington, Daniel Gerroll, John Douglas Thompson and Sherry Boone. R&H : Tell us a little about each of these shows. Elmar Juchem: To put these shows in context, one has to keep in mind that Maxwell Anderson was the most prolific playwright on Broadway in the 1930s and 40s. When Weill approached him and convinced him to work for the musical stage, that in itself sent a signal that musicals could be more than mere entertainment. KNICKERBOCKER HOLIDAY (1938) is still a musical comedy, and consciously so (with some obvious elements of operetta), but it also offers a hilarious and pointed critique of governmental power growing out of control. Loosely based on Washington Irving’s A History of New York by Diedrich Knickerbocker, the show is set in 17th-century Dutch Manhattan. When the new governor, Peter Stuyvesant, turns out to be a tyrant, a young independent thinker named Brom challenges his government—and his claim on the woman Brom loves. Their contest of wills creates a broad satire that pits democracy against totalitarianism, with the required dash of romance thrown in. In LOST IN THE STARS (1949), Weill and Anderson turned the notion of “musical comedy” on its head: they billed it as a “musical tragedy”—common in opera houses but not on Broadway—and gave it the character of a chamber musical. The use of the chorus follows the Greek model, which Weill had successfully employed in some of his German works in the early 1930s. For some ten years, Anderson and Weill had wanted to create a work that commented on the appalling state of race relations in the U.S. They couldn’t do that directly, so when they came across Alan Paton’s 1948 novel about apartheid South Africa, Cry, the Beloved Country, they knew they had a vehicle that would indirectly, yet unmistakably, comment on the situation at home. Lost in the Stars takes a hard look at the big issue of segregation by dramatizing an intimate story of two aging men—a black country parson and a bigoted white planter—who are ultimately brought together through the tragic deaths of their sons. R&H : What was it about these shows that appealed to you / made you want include them in your season? Ted Sperling: I’m a huge Kurt Weill fan, so it was an immediate “yes” when I was asked to direct KNICKERBOCKER HOLIDAY, even though I didn’t know really know the piece. I was excited to have an opportunity to explore another Weill rarity, having conducted THE FIREBRAND OF FLORENCE with the Chorale two years ago. I did know several of the songs already, but I knew very little about the script. But I often take on projects for that very reason: to be given an opportunity to dive into the unknown! The fact that we would be making the first cast album of the show was also exciting to me. Rob Berman: I have long been fascinated by the score for Lost in the Stars and ever since I became Music Director of Encores! I looked for an opportunity for us to present the show. It has been many years since we produced a show by Kurt Weill and it seemed like a good time to present a darker, more dramatic show. I think it is important that we vary our seasons and present a mix of light-hearted fare (like Bells Are Ringing or Where’s Charley?) as well as shows that are more serious-minded. R&H : How did you approach Knickerbocker Holiday / Lost in the Stars? TS: When I did get to know the script, I realized it was a huge challenge to present in concert form. First of all, it is very verbose, so I needed to cut at least half of the dialogue. Second, it relies on some very specific aspects of the set: there are two scenes involving a noose and scaffold, and another involving a tug of war through a hole in the wall of a jail! And third, Peter Stuyvesant is supposed to have a wooden peg for a leg! How was I going to accomplish this at Alice Tully with no set or costumes? I decided that we would embrace the concert nature of the performance, and let the audience fill in all the gaps with their imaginations. We performed the piece in tuxes and gowns, with a beautiful image of old New Amsterdam floating above the stage. Another challenge in adapting the script for concert performance was how to grapple with the political incorrectness of its reliance on drunken, war-crazy Indians as the enemy. Of course, the real enemy in the piece is Stuyvesant, but there is much talk of selling brandy and firearms to the Indians, and this is so central to the mechanism of the plot, that it’s really impossible to eliminate it. I decided, ultimately, that we needed to present the piece as it was written, and that to try to sanitize the material wouldn’t work. The narrator of Washington Irving mentions early in the piece that this took place in a more innocent time, “before the Indian Tribes had turned to wood or reservations”, and I decided that we would play it as written. The image of the city I mentioned earlier is taken from an old map, and is framed by the figures of two rather mournful-looking Native Americans, so I hope some audience members took that in and appreciated the resonance. RB:Weill’s music requires a high level of fidelity to the musical values and to the style. At the same time, he was a dramatist and I have encouraged the actors and singers to find the truth of the characters and the story within the framework that the score gives us. Often this piece is cast with opera singers, but we chose to cast great musical theater voices who we felt could fully meet the acting demands of the piece as well. One of the major features of the show is the use of a contemporary Greek chorus. The chorus sings almost half of the score so I needed to cast a group of singers who were also wonderful musicians who could learn the music quickly. Our chorus has 19 members, the same number as the original Broadway production. Another decision I made was about the orchestration. The original production in 1949 had an orchestra of only 12 musicians, which was very small for the time. It was Weill’s intention that the show would have a smaller, chamber-style orchestration. At some point an augmented orchestration was created, but in the spirit of the Encores! approach to things, I chose to present the show as it was originally heard and we will perform it with just the 12 musicians. It is a wonderfully distinctive sound. R&H: What were the reactions to Knickerbocker Holiday and Lost in the Stars when each premiered on Broadway? R&H: How do you think these shows will resonate with audiences today? RB: I think the human story that is presented in Lost in the Stars will be affecting. Certainly it is a political piece that deals with race relations and apartheid in South Africa. However, it is also a story about community, faith and family and how people deal with terrible events that take place. The show is subtitled a “musical tragedy” but I’m hopeful that the audience will leave feeling uplifted about man’s ability to endure and to remain hopeful about the future. R&H: Kurt Weill collaborated with many different writers, from Bertolt Brecht to Ira Gershwin. What are some of the most interesting or unique aspects of Weill’s collaborations with Anderson? EJ: Anderson was not only a playwright but also a poet (like Brecht), which made him an ideal candidate for musical theater, as he could do both book and lyrics. And he trusted rather than envied Weill’s dramaturgical judgment. Likewise, Weill admired Anderson’s skill, humor and overall concept of theater and its role in society. So they became good friends and neighbors. R&H: What is your favorite song (or two!) from each show? EJ: “It Never Was You” from Knickerbocker. As for Lost in the Stars, I love the whole score from start to finish. TS: The most famous songs from KNICKERBOCKER HOLIDAY are “September Song” and “It Never Was You”, and I think deservedly so… they are both gorgeous melodies and the lyrics are the strongest in the piece. But I was also very taken with another love duet, “Will You Remember Me”, that was cut shortly after the show first opened on Broadway. There’s also a surprisingly long and serious “Dirge for a Soldier” that seems like it belongs in an oratorio… it’s very beautiful, and the Chorale was at its finest singing it. RB:That’s hard to choose, but I am very fond of “The Little Gray House” in which Stephen sings to his little nephew about what life is like in his village. It is a gentle, evocative song about the simple joys of his domestic life. It is wonderfully intimate and musically lovely. Watch videos from the rehearsals and opening night of New York City Center Encores! To put these shows in context, one has to keep in mind that Maxwell Anderson was the most prolific playwright on Broadway in the 1930s and 40s. When Weill approached him and convinced him to work for the musical stage, that in itself sent a signal that musicals could be more than mere entertainment. Knickerbocker Holiday (1938) is still a musical comedy, and consciously so (with some obvious elements of operetta), but it also offers a hilarious and pointed critique of governmental power growing out of control. Loosely based on Washington Irving’s A History of New York by Diedrich Knickerbocker, the show is set in 17th-century Dutch Manhattan. When the new governor, Peter Stuyvesant, turns out to be a tyrant, a young independent thinker named Brom challenges his government—and his claim on the woman Brom loves. Their contest of wills creates a broad satire that pits democracy against totalitarianism, with the required dash of romance thrown in.